We order take out often in our house, with busy schedules and big appetites sometimes cooking dinner just doesn’t happen. But with take-out comes a lot of sodium, a lot of preservatives and A LOT of random calories that you simply don’t need in your lives. On most occasions I avoid rice, white or brown even unless it is something that I feel NEEDS rice, like sushi, and if I could replace that with quinoa too I probably would. 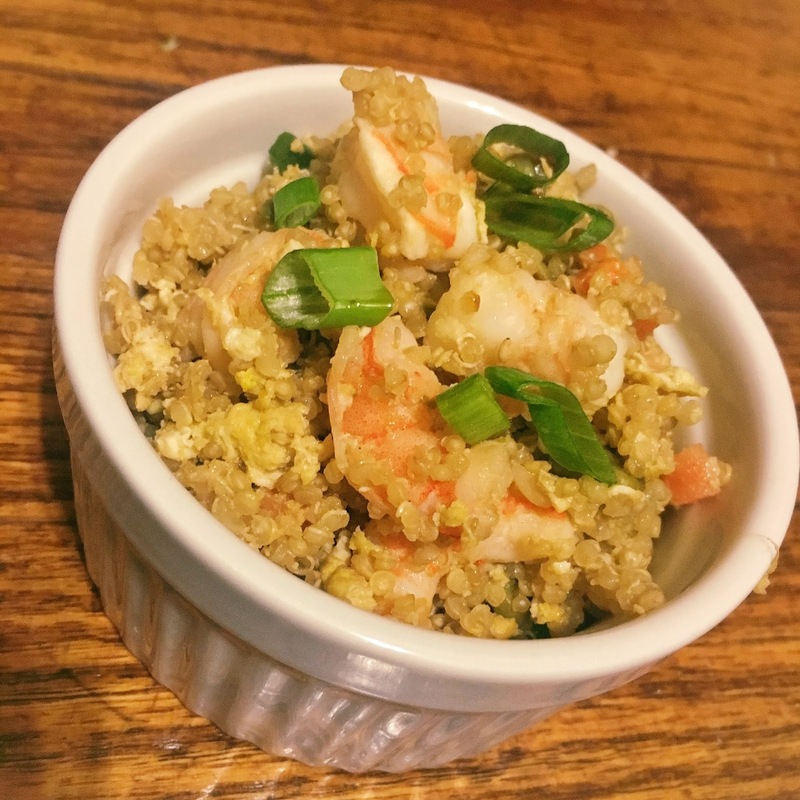 Quinoa is gluten free, a whole protein and is chock full of amino acids and on top of that, it's delicious! If you aren't a quinoa fan you can do this exact same recipe with your favorite rice! In a small pot add the quinoa, water, and two tea bags. Bring to a boil, lower the heat and cover, approximately 15 minutes. Carefully remove tea bags, cover and set aside. In a sauté pan or wok, heat the oil up and add the carrots, let cook for approximately 1-2 minutes, add the garlic, and the shrimp and cook until the shrimp begin to turn pink, add the peas. Break the two eggs into the pan and begin to scramble until the eggs are almost cooked. Add the quinoa and soy sauce and stir to combine. Serve hot with green onions on top. This was FANSTASTIC on its own and even better covered in the Korean Beef and the sauce that goes along with it. Add as much or as little soy sauce to the quinoa as you wish, the first time I made the recipe I felt it was lacking salt and the right amount of soy sauce is the perfect accompaniment. If you are making this on its own feel free to add a few dashes of sesame oil to the coconut oil for even more flavor. If you don’t have green tea bags simply use regular water, or you can cook your quinoa in any broth you have on hand, I like that the green tea adds a subtle flavor to the nutty quinoa. Don't like shrimp? Sautee some chicken, beef or pork! Vegetarian? Some meaty mushrooms or tofu would be excellent as well! Want more egg? Throw another one in! Or any combination of the above! There's no extra charge in this house!